The word “divine” suggests the intangible energy of the Universe. Nation represents the bringing of that energy into a system that can be interpreted. How are we to know the intangible and interpret it? Divine-Nation systems create boundaries by which to define the nature of the Universal energies. These boundaries become Universal Symbols from which the mundane or physical details of the situation can be “read.” Diviners are trained to read these symbols using their intellectual knowledge guided by their intuition. A specific symbol “The Chariot Card” might represent certain types of travel for example. The Diviner using this symbol and other cards relating to the “wealth” and “purchases” might get a feeling that the seeker will buy a new car soon. I was taught to use “Intellect guided by Intuition.” This means that my knowledge of the system is combined with what I feel, see, and experience as I observe and feel the Seeker’s energy in my presence. Once the Seeker is given the information it is his to use as he wishes in order to either keep the movement of energy going in the direction it has been divined or make a choice to change it. Palmistry: The reading of lines, size, and shape of the hand. The idea is that we are born with certain gifts and tendencies which are expressed in our hands. As our life evolves so do our hands and so the reading may change over time. Astrology: The belief that the objects of the cosmos give us a understanding of the energies that are affecting us. Different parts of the cosmos and different planets and stars represent different energies and their affect on us. By relating the current state of the Universe in to the state is was when someone was born you can get an idea of how the individual is being affected by the Universe. By knowing where the planets will be you can read the future energy. Numerology: The belief that the entire Universe is represented by ten numbers. Numbers are not random but represent different energy frequencies. The energy of the universe expresses itself with numbers which we see and encounter everyday in things like Dates, Times, Amounts, on signs and in other places. You can add up the digits of many digit numbers and combine their values to make any number into a single digit. The Seekers birthday can be made into a number, today’s date has a number, the current year. Thesea are all used to divine different relationships between you and the Universe. Color Reading: Colors are literaly different wavelengths of vibration. Different colors can be related to different states of being. By paying attention to what someone is wearing or what colors they choose you can learn a lot about their state of mind and situation. Runes – Ancient runes are symbols and can be used for divining. This includes any alphabet like the Hebrew Alphabet or even our own. 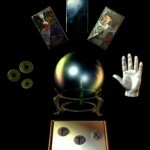 Tarot – Tarot is the swiss army knife of Divination. It uses colors, seasons, elements, numerology, astrology, and many other systems combined to create a cohesive whole system of understanding realities symbols. There are thousands of different Tarot decks. The one I learned From is called the Rider-Waite Tarot. It was developed by the Golden Dawn based on many ancient Tarot systems and adapted to their interpretation of the occult knowledge. Rider-waite Tarot splits the Universe into 78 parts each represented by a card. Each card is a situation which can be looked on from two different directions. There are 56 Mundane Cards which represent the lower forms of physical reality and the cycles of generative life. These cards are much like the cards of a modern playing card deck. There are four suits. Representing the four elements earth, air, fire, water. Each suit has 10 cards representing the numbers in numerology and four court cards representing people the four forms of man Page, Knight, Queen and King. Do a one card reading for meeting. Discuss the meaning of the card after the meeting. Thank you for your posts and for what you are doing here! Admirable work and much success in your bienusss dealings! Please excuse my poor English as it is not my first tongue. This is a rather incredible write-up. Can I use this on my website? Also, even though I’m here I’d like to see if you want to take a look at my internet site about making money on line. I’m certain there’s several pointers on there that you’d like. Thanks! Blasphemy! LOL Just kidding. Ive read similar things on other blogs. Ill take your word by employing this. Stay solid! your friend. This really is among the top posts that I’ve ever seen; you could include things like some even more tips in the similar theme. I’m nevertheless waiting for some intriguing thoughts from your side inside your following post. The plan will only utilize to people that could not satisfy their debt repayments.